Hangzhou Fuyuanhua colour steel Co., Ltd.
Hangzhou FuYuanHua Color Steel Co., Ltd. was founded in 2003. 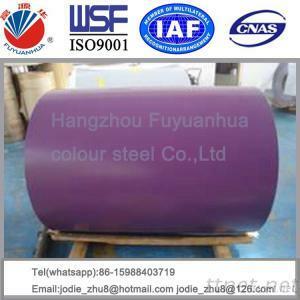 Our company is professional in the production and sale of various galvanized color steel coil, aluminizing and galvanized color steel coil, galvanized coil and etc. in addition, our company has advanced technology, equipment and professional technical person. Our products are welcome in Southeast Asia, South Asia, America, Middle East, East Europe and North Africa by complete specification and superior quality. And we also provide custom-made service. We make effort to provide wide customers with most excellent product and satisfied service in shortest time. We do believe “customer is the basis for enterprise survives”. And we would like to create brilliant future together with you!